Have you hiked Nordhouse Dunes lately? Our favorite trails and wilderness areas are getting crowded and not just on the weekends. 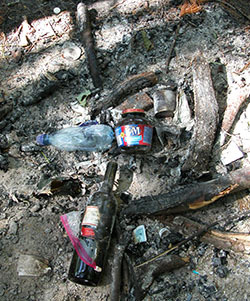 What’s the solution to overrun campsites and the growing amount of trash left in the woods? Are reservations or strict permit systems to the backcountry a permanent part of our future? Jim DuFresne, the main blogger for MichiganTrailMaps.com, examines the emotional issue. Fall is here and the hiking is fine, especially in the Pigeon River Country State Forest north of Gaylord. Check out our Shingle Mill Pathway and Green Timbers Map in our eshop and then head north for the weekend. Maybe you’ll see an elk. Among the many titles I have penned was a guidebook to Glacier Bay National Park. I had visited the park often while living in Alaska and then spent two summers there researching the book after moving back to Michigan. During one of the summers two friends and I hiked what was simply referred to in the park as the Outer Coast; a 70-mile, 8-day shoreline trek along the Gulf of Alaska where on one side of you is the pounding surf of an immense ocean and on the other the glorious peaks of snow and ice that are the Fairweather Range. We watched giant brown bears feast on mussels, humpback whales and orcas swim offshore, roasted freshly caught salmon over an open fire on the beach. It was, and is still, one of the most amazing backpacking trips I have ever undertaken. But that winter when I was actually writing the book I began receiving letters from a handful of residents of Gustavus, the small outpost that serves as the gateway to Glacier Bay. Having learned that the guidebook was going to be published, they were asking me not include the details of the trek – not to mention the area at all in fact – fearing the publicity would bring hordes of people from around the country and permanently alter that pristine wilderness on their doorstep. I was caught in an ethical dilemma but after much deliberations decided to keep the chapter about the Outer Coast. I argued you can’t preserve a wilderness through knowledge or more specifically the lack of it. If you do, then the area becomes a private playground for only Alaskans, particularly those from Gustavus. The backpacker from Georgia will never have an opportunity for such a high-level adventure simply because he or she is not aware of it. That’s unfair because it’s their national park as well. Trash and a fire pit in Nordhouse Dunes, a federally designated wilderness on Lake Michigan. If the Outer Coast is endangered of being over used then you have to regulate the number of visitors, I said, in the same way that Alaska’s Denali National Park was already doing with a strict permit-and-number system to its backcountry. They didn’t agree and we went back and forth in a series of letters and replies. In the end it became a non-issue. I suspect my guidebook had little impact on the area other than being a good read. Rather the logistical challenges and high cost of such a trip – you needed a lot of float plane time for the drop-offs and pick-ups – kept the number of visitors to the Outer Coast naturally low. But I thought about that winter recently when the administrators of a Facebook page devoted to backpacking and hiking announced they were deleting all posts and comments about the Manistee River Trail. This 11-mile trail stretches along the Manistee River in the Manistee National Forest and is extremely scenic, relatively level and easy to reach as no long drives or ferry trips are involved. It features 22 walk-in campsites and a rare Lower Peninsula waterfall and is connected to a segment of the North Country Trail to form a 23-mile loop. That’s particularly important for many people; you end up where you start at a trailhead where your car is parked. Easy logistics. Although the Manistee River Trail wasn’t totally linked to the NCT until 1996 when a massive foot bridge was built, I think it’s safe to say the loop today is by far the most popular backpacking destination in the Lower Peninsula. And that has caused problems. 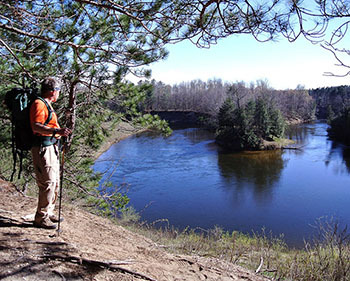 A backpacker pauses to admire the view along the Manistee River Trail. Twenty-five years ago I wasn’t sure if that was a solution to people overrunning an area and I’m not sure today. For starters the Manistee River Trail is hardly the only area where overcrowding in the backcountry is problem. Anybody who has been to the Nordhouse Dunes lately, a small Federally-designated wilderness on Lake Michigan, has also witness beach crowds and trash. The problem is that the number of people who use trails and natural areas to escape for a night in the woods or two is growing. The number of non-motorized areas where you won’t be buzzed by ORVers or have to listen to traffic all night is not. To protect them we absolutely have to educate the people using them. There needs to be constant reminders to carry out your trash and pick up any that you see lying on the ground. You cannot leave remnants of campfires or maybe not even have campfires if there are no permanent fire rings in place. Please don’t leave wads of toilet paper in the woods after you do your business in the morning. Pack it out. And so on. That’s where public pressure via social media can really help. But eventually reservations or a formal permit system will be needed to control the number of users in an area to avoid overcrowding. This is a growing trend across the country, including Michigan. Beach chairs and beer coolers in the Nordhouse Dunes. You don’t need a permit to hike the famed Lakeshore Trail in Pictured Rocks National Lakeshore but you need one to stay in the backcountry campsites along it. The sites are in such a high demand in the summer there is a reservation system in place to secure one in advance. 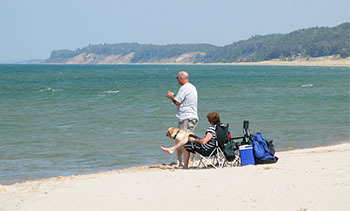 If you’re late booking a seat on the ferry to North Manitou Island, the popular backpacker’s destination in Sleeping Bear Dunes National Lakeshore, chances are you’ll be disappointed when the boat is already filled every weekend in July. And last year dispersed camping at Porcupine Mountains Wilderness State Park was eliminated and the 63 backcountry campsites must now be registered and reserved online in advance from May through October. In every case this is basically crowd control. It’s probably not fair, it’s a hassle and it’s certainly not free. But the alternative is the Manistee River Trail where in the middle of August every campsite is already taken when you arrive and fire rings are little more than a place to leave a smothering heap of half-burnt trash. At that point the worse thing you can do is to stop talking about it.